It's linky party day! Woot!! 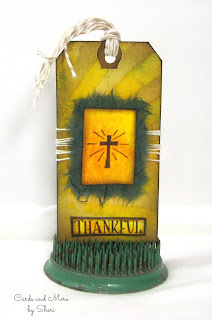 The theme for November was Fall/Thanksgiving, or thankful, which was my spin on the tag this time. For starters, here's my process video. I totally forgot to take still pictures throughout the process! My mistake! 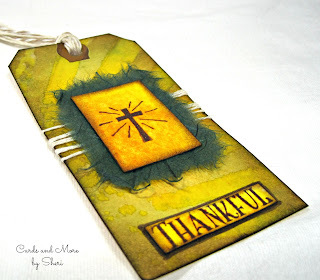 My tag stayed fairly simple this month, as I didn't want to overwhelm the message I had in mind. When I started thinking about what I wanted to do, I kept coming back to being thankful and gratitude. Sure, I could have gone the pretty leaves and a turkey route, which is perfectly fine, but I decided not to. What am I thankful for? Well, there's a ton of things I could mention. But what it all boils down to is that I'm thankful for Jesus, from whom all my blessings are derived. He made the ultimate sacrifice for me on the cross, and saying I'm thankful for that is a huge understatement. 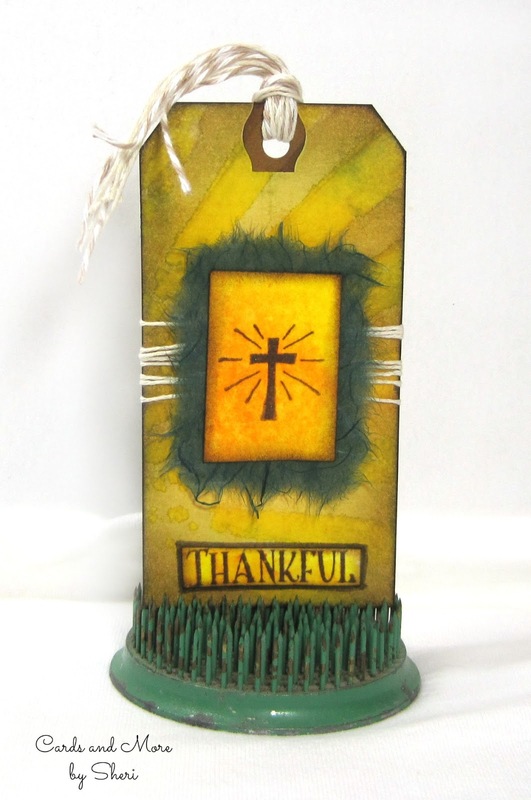 Psalm 100:4 says "Enter his gates with thanksgiving and his courts with praise; give thanks to him and praise his name." In some small way, that's what I tried to do with my tag. 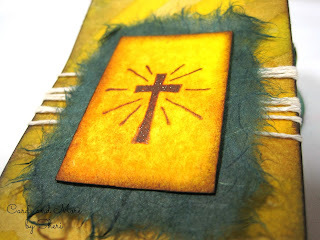 This was the first time I'd used the Tim Holtz "Rays" stencil and I really like it. 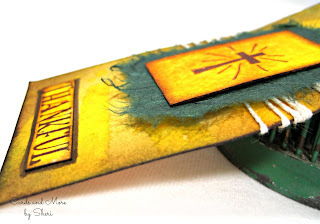 It's got some really great grungy detail to it! Of course, Distress Inks and Dylusions Ink Sprays are always a fun choice! 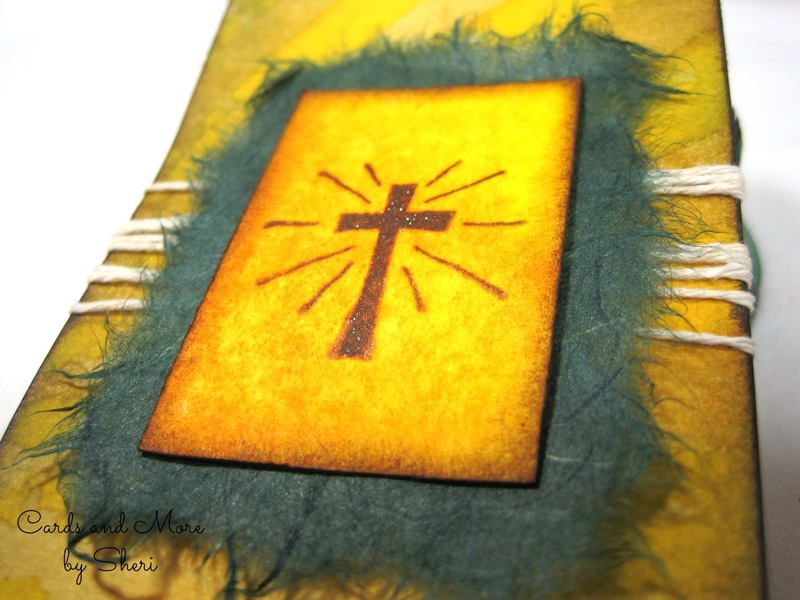 I tried to add a little extra dimension by wrapping twine around the tag, and then attaching the cross image with foam dimensional tape. The word panel is simply outlined with a PITT Big Brush Artist Pen. Did you play along with this month's theme? It's not too late to join in and link your creation below. Be sure to visit the other participants and leave them some blog love as well! I hadn't used it in a long time either. I loved the frayed edges you can get with it. Great tag Sheri. Bust that stash! Thanks, Peg. It would take years to bust all of that stash lol. Love, love, love, love, love this tag Sheri!! You hit it with this one, it is beautiful!!! I love watching your vids! :) Blessings to you!